Imaging Informatics: Time for a Chat? Questions often arise about the most appropriate imaging test for a patient's clinical considerations, and more than one physician has probably wished at some point that he or she could text a friend and get a quick answer. Thanks to researchers at UCLA, that day may be coming sooner than people realize. At the Society of Interventional Radiology's (SIR) Annual Meeting, the UCLA researchers unveiled an artificial intelligence-based IR chatbot that can provide advice to health care providers about the most appropriate imaging tests and procedures. Not sure what a chatbot is? In the UCLA iteration, it's basically a computer-driven decision support tool that answers questions via text message. The answers may take several forms, including text, graphs, links to websites or custom programs, or referrals to a human source. 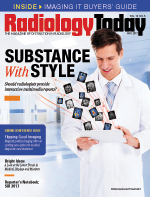 To provide answers to the most commonly asked IR-related questions, the researchers surveyed approximately 100 physicians for feedback about what they need to know and what they find most helpful in their interactions with radiologists. Kevin Seals, MD, a third-year resident in diagnostic radiology at UCLA Health and the chatbot's programmer and lead developer, says the chatbot doesn't provide interpretation-based information; it provides answers to questions in a way that's similar to a radiologist. "We wanted to create something that our [point-of-care] clinician colleagues would really love," Seals says. "So, using that approach, we identified the steps that clinicians care about, and everything else sort of flowed from there as to what our users are looking for." The chatbot runs on a neural computing network that uses deep learning algorithms. Although he experimented with a few different algorithms, Seals chose IBM's Watson application program interface because it's well established, easy to use, and worked well in preliminary testing. A large database is used to train the chatbot, which "learns" and becomes increasingly accurate as it's exposed to more data. Seals says the chatbot is approaching near-perfect accuracy on many common questions but is still being trained to answer questions that are more clinically vague. He expects the chatbot's accuracy to continuously improve as the project scales up to include all of UCLA and, eventually, other institutions. "The only thing separating us from our current level of performance and completely perfect performance is, essentially, more training data to make a smarter neural network," Seals says. "We've got a very strong and powerful foundation that will get better and better as people use it more." Seals describes the chatbot as a highly sophisticated search engine that presents up-to-date, evidence-based information. Users can type or use the voice function on their iPhone to ask questions. A team of academic radiologists has reviewed user questions and curated the responses based on high-quality data that are supported by radiology literature. The most common ones relate to recommended imaging or IR procedures for specific clinical conditions or contraindications for specific exams, such as whether a patient with a reduced level of kidney function can get a study with contrast or a patient with a metallic implant can get an MRI. Seals says the physician survey identified a wide range of potential questions that have been addressed. Edward W. Lee, MD, PhD, MSc, an assistant professor of radiology in the IR division at UCLA's David Geffen School of Medicine and a coauthor of the SIR study, says the project benefits the IR community in two ways. First, it is the first deep learning-based process that is being implemented for IR. While health care is still in the dawn of the deep learning revolution, he believes that there will be numerous opportunities to expand the scope of the chatbot application. "This app transmits vitally important information that needs to be communicated between radiology and other physicians in the hospital," Lee says. "And it really saves us time to perform better patient care." The second benefit is that the chatbot supports recent trends in IR. Lee says IR has historically been referral based, but it is becoming a more clinically oriented subspecialty with dedicated residencies and a greater degree of involvement with hospitals as clinical faculty. The chatbot will initially be available as an app on iPhones, but Seals envisions eventually expanding its availability to chatbot stores such as those run by Facebook, Kik, Slack, and WhatsApp. Because it draws on well-established clinical guidelines, he doesn't expect significant FDA delays when he and his colleagues decide to make it available outside of their medical system, but that isn't yet in the works. For now, they are refining the chatbot with their test users in anticipation of releasing it UCLA-wide in the near future. Seals, however, sees more possibilities on the horizon. "Right now, it's a radiology/interventional radiology chatbot, but, at the same time, we've created a kind of foundational technology that can be used to create any sort of medical subspecialist chatbot. It's not just this radiology chatbot, it's a framework or a platform for creating other things," Seals says. "Any other clinical specialty can be turned into a chatbot using the technology we've created. That would be really easy to do, and that will be one of our next steps, as well."